Friday September 30th 1921 I did my ironing in forenoon. Rob & Cora went to Cedar Rapids in the afternoon. I walked to town to do some errand. Was up in Otts office and got my bank book. Came home with Mrs Dunlap. To bed early. Saturday October 1st 1921 I got up and ate some breakfast to start to Washington with Ott and LeGrand. It was a nice ride and we got home at noon. I worked all afternoon in my part of the house. I got Mothers room ready for Ida who comes tonight. Cora busy at home all day. Hattie in town all day at a rummage sale for Old Ladies Home. weather fine. Sunday October 2nd 1921 Hattie went to church. Cora and I got the dinner. Rob & Cora at store in afternoon and away for supper. Hattie to town soon after supper. Ida and me visiting together. Monday October 3rd 1921. The girls did a big washing. I helped some and Hattie and I ironed most of the things in afternoon. Ida Anderson and Mary called. Cora working at store. Tuesday October 4th 1921 Rob & Cora and I had our breakfast to start with LeGrand and Fannie to Marshalltown at 7 oclock in The Hudson car. A fine ride and there in time for dinner. Wed drove around the city. made some calls. Cora bought a fur coat. 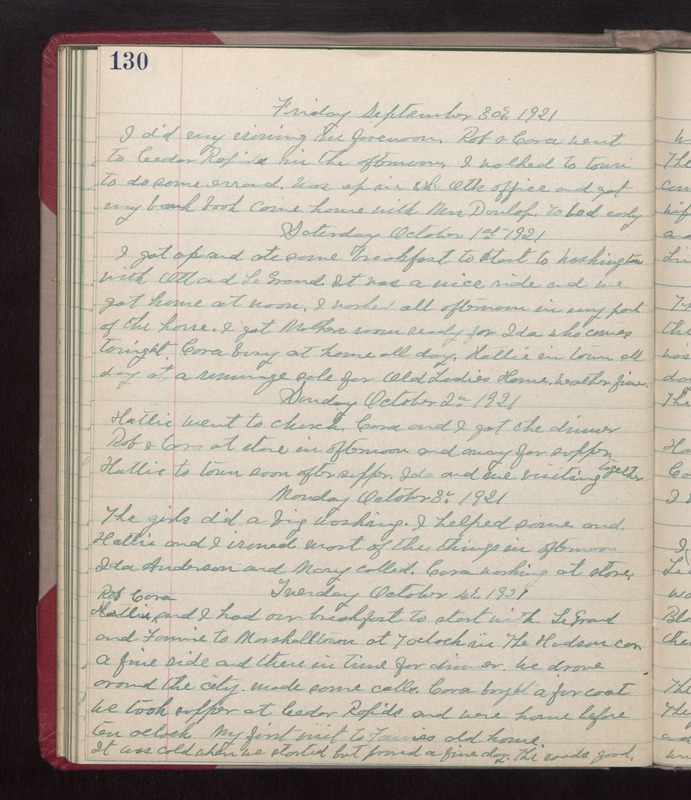 We took supper at Cedar Rapids and were home before ten clock. My first visit to Fannies old home. It was cold when we started but found a fine day. The roads good.